Full moons during the year have many different names in many different cultures. Most people want something in the sky to be special and unique to their lifetime on Earth. An Earth that has been here for four and a half billion years. From Earth, the full moon appears fully illuminated because it is positioned directly opposite the Sun. The June full moon is called the Strawberry Moon. Because the June full moon never gets comparatively high above the horizon, nor does the Sun get comparatively low below the horizon, the Strawberry moon is characterized by its reddish to honey-colored tint from sunlight filtered through our atmosphere. This year the Strawberry Moon coincided with the June Solstice in the northern hemisphere. A Strawberry Moon on the summer solstice hasn't happened since 1948. 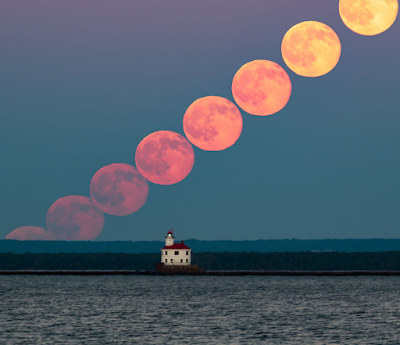 Delicious 'Strawberry Moon' Photos: Rare Solstice Lunar Show Wows Stargazers, Calla Cofield, Space.com 21 June 2016. Neil deGrasse Tyson Explains The "Strawberry Moon", video clip from The Late Show with Stephen Colbert The Late Show with Stephen Colbert, 23 June 2016.